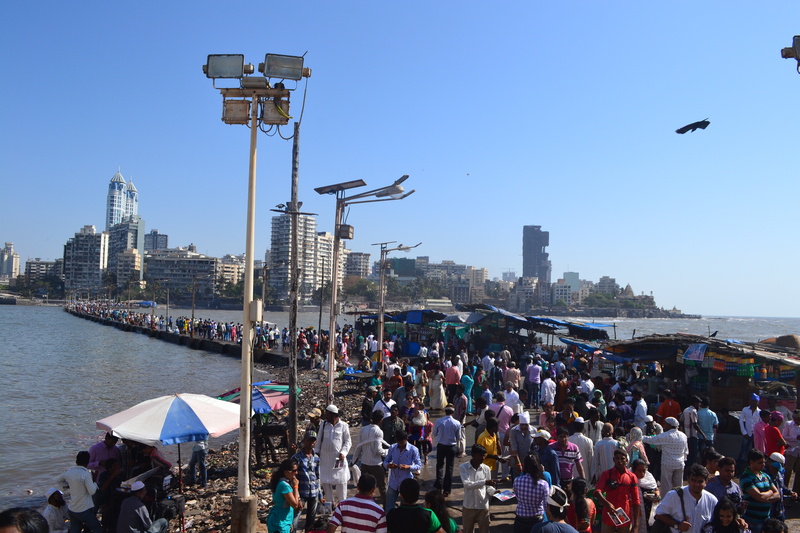 Just beyond Mahalakshmi station and over the rail bridge lie the dhobi ghats. These are concrete vats where dhobiwalas wash laundry every day; loads of washing are brought here from all over the city to be soaked and beaten at the dhobi ghats. 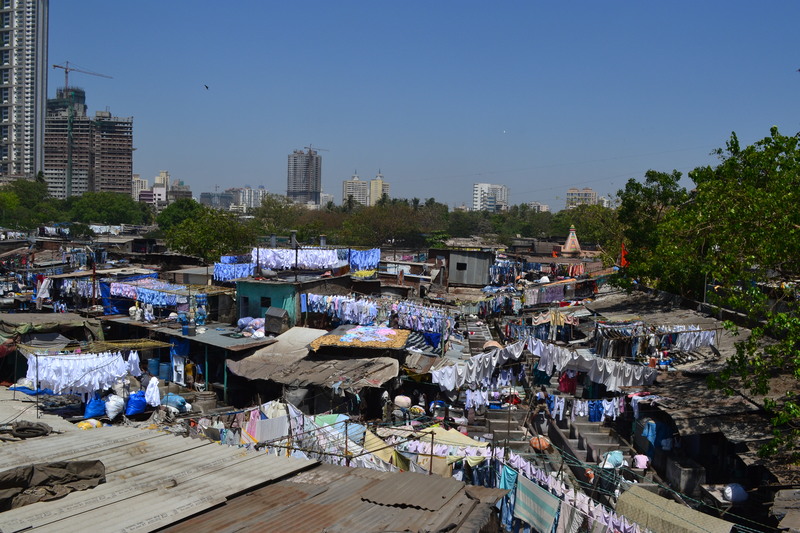 Mumbai’s dhobi ghat is said to be the largest outdoor laundry in the world. There are about 700 washing platforms, each with its own flogging stone. Here you can see the washing lines strung up above the ghats. ‘Well, how many do you have?’ I asked him. He pulled some other coins out of shirt pocket, and I counted them over in his small hand. ‘That’s about 400 rupees,’ I concluded. He did not really react, except to pressure me to buy one of his bags again. I said I didn’t need one, and then he said just to give him some money then. It’s difficult, because you feel bad for them, and there is no welfare system. So effectively handouts to those with very little could stand in the stead of a welfare/benefits system that is provided by the rest of the population via a system of taxation. However with children, many charities say that it is better to donate to their projects directly that help to take children off the streets, for while they can continue to ‘earn’ money on the streets they will continue to be sent there to do so. I don’t know what the solution is. Although I quite wanted to give that boy some money, there were too many other children clustered around to be able to distribute anything fairly. 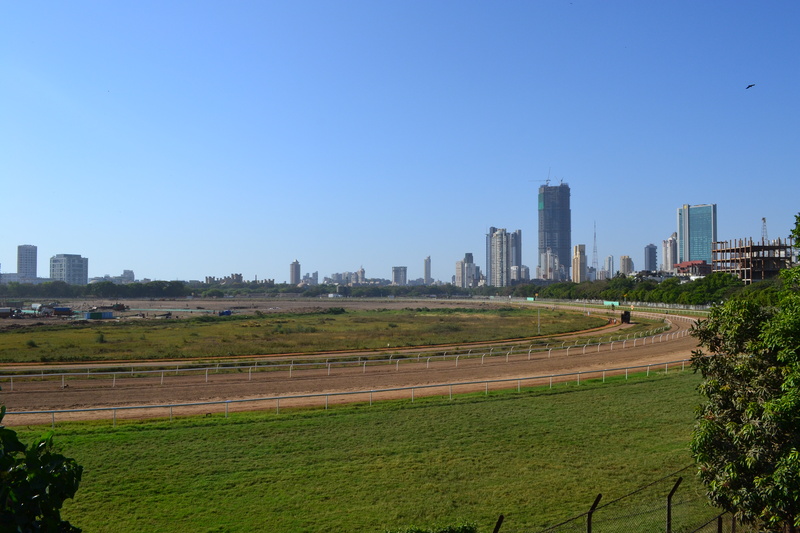 Crossing the road outside the station, I walked down towards the sea, beside the Mahalakshmi race course on my right, and a golf club on my left. 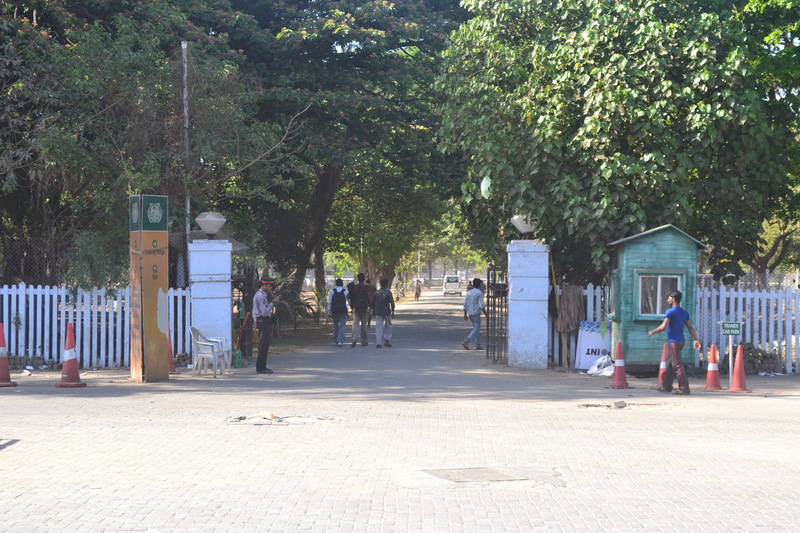 Entrance to Mahalakshmi Turf Club and race course. The race course is mostly isolated from the road by a thick layer of trees. There are a few gaps in this wood near the station, from where I took these photos. You can see riders on their horses cantering around in the central arena, and people sitting in the stadium far off in the distance to the west. 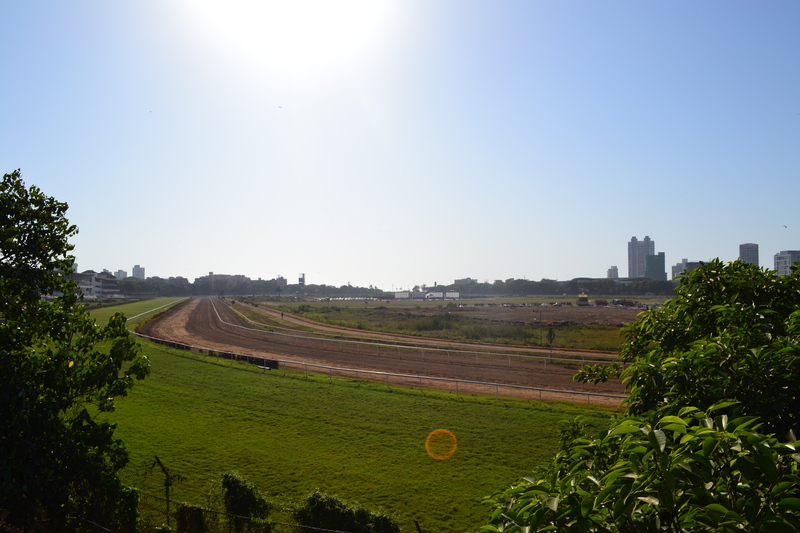 The race course is vast, and continues for almost the whole way along the road down towards the sea. A slum has arisen on the periphery of the race course, where it borders the main road. This was a slum with a difference, because it is entangled in the forest. Its rambling dwellings and earth lanes lie underneath a shady green canopy; vast trunks of old trees grow up beside mounds of litter and ruinous walls. A wall runs beside the main road and pavement, and beneath the wall there is a lower road that runs alongside the slum houses. I saw a woman climb down through a hole in this wall into the shaded subterranean settlement beside the race course. It looked alluring, those green fronds and earthen walls out of the direct sunlight. The two roads meet at the very end, near the sea. 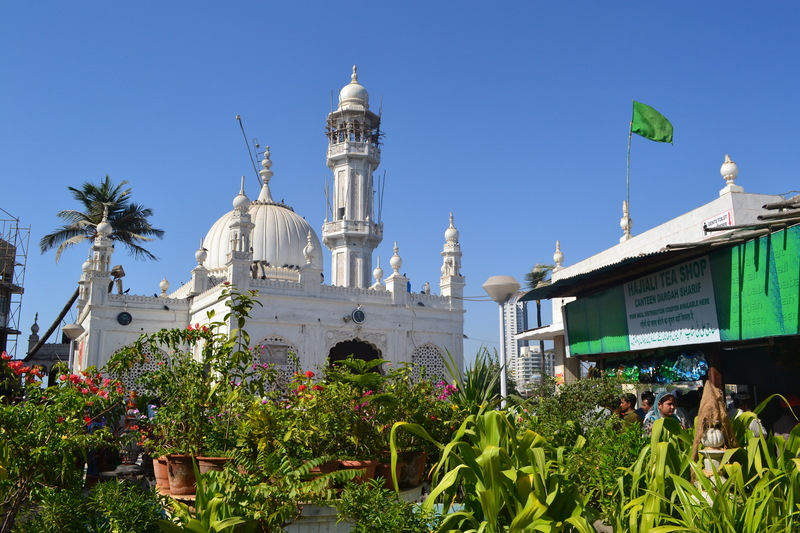 I took the subway underneath the large junction of intersecting main roads, and came out opposite Haji Ali Dargah – the tomb of Sayed Peer Haji Ali Shah Bukhari. This Muslim saint was a wealthy merchant originally from Bukhara in the ancient Persian Empire, who settled in Mumbai in the 15th century. He died while on pilgrimage to Mecca, and his body was placed in a casket in the sea. 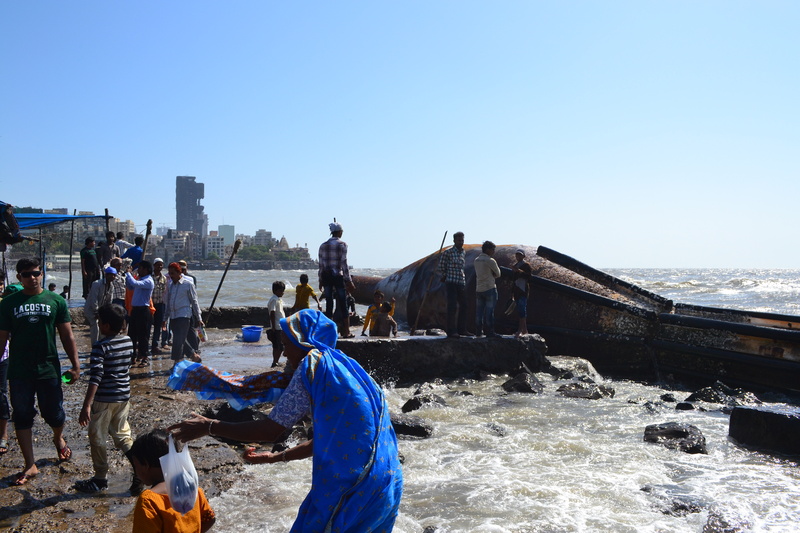 It was carried on the tide back to rest on the rocky shore of this cove in Mumbai, and his tomb and a mosque were built around where the casket lay. 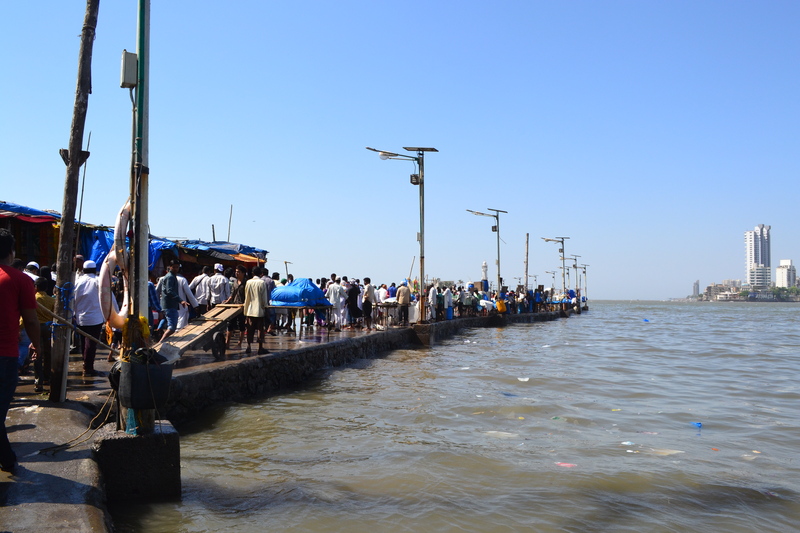 The island containing the tomb lies in the middle of Worli Bay, and is attached to the city precinct of Mahalakshmi by a causeway. This long, narrow causeway is only accessible at low tides. 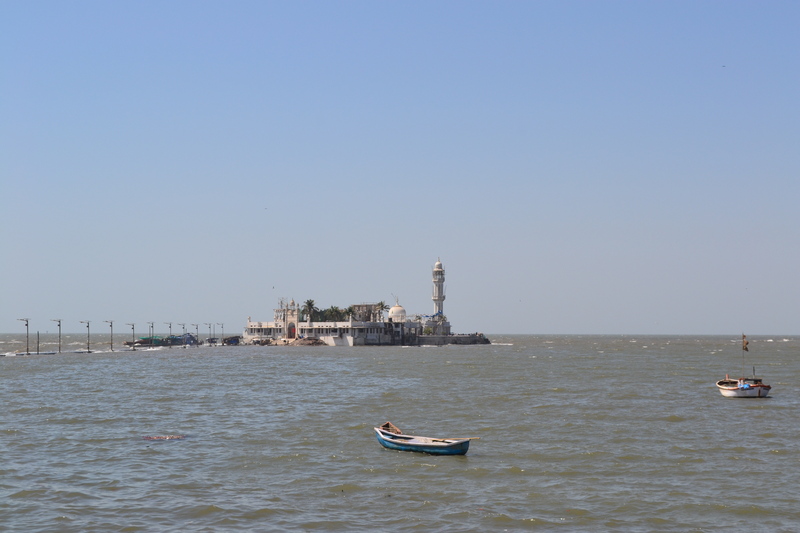 I joined a dense huddle of other people standing and sitting along a short piece of wall, where they could see the Haji Ali Dargah. 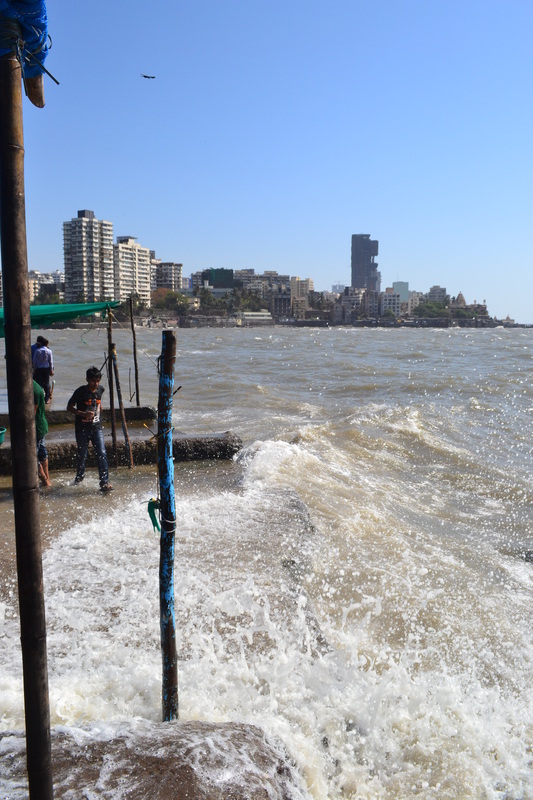 The causeway was being swept over with waves, as the tide was too high. 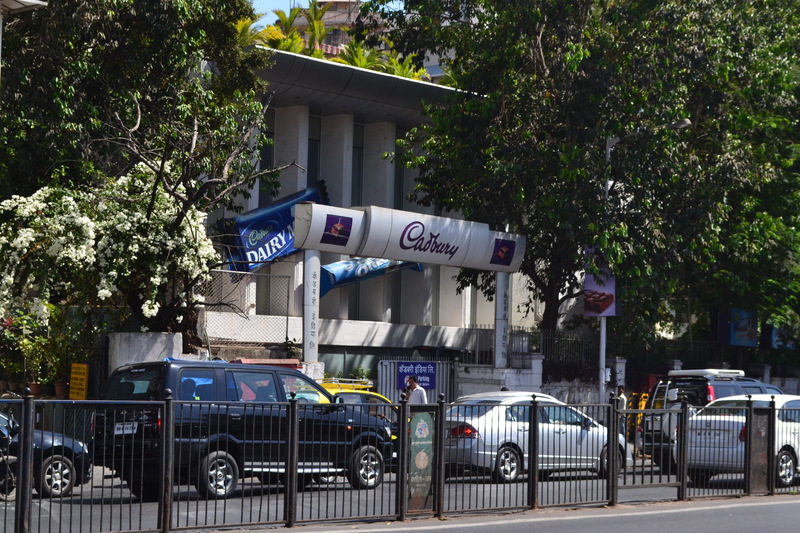 I continued walking and went to a temple, passing a Cadbury factory. 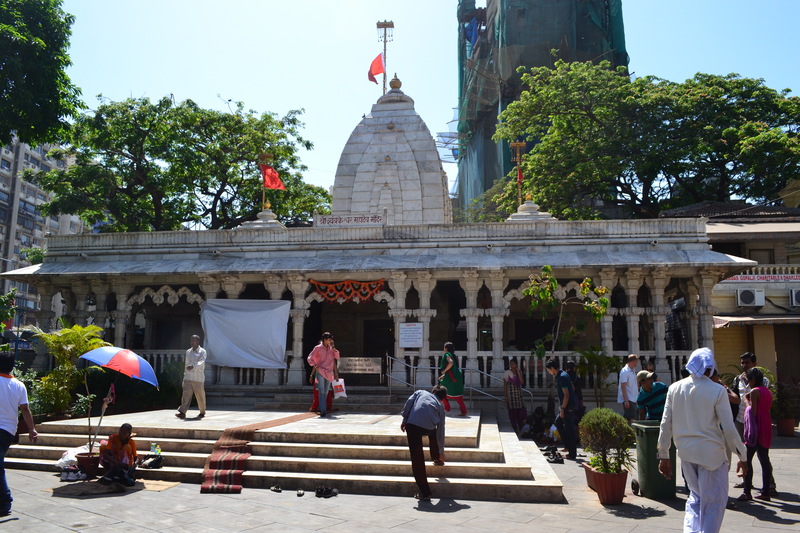 This is the entrance to the temple complex, with a statue of Lord Ganesh above the doorway inside the protective casing. 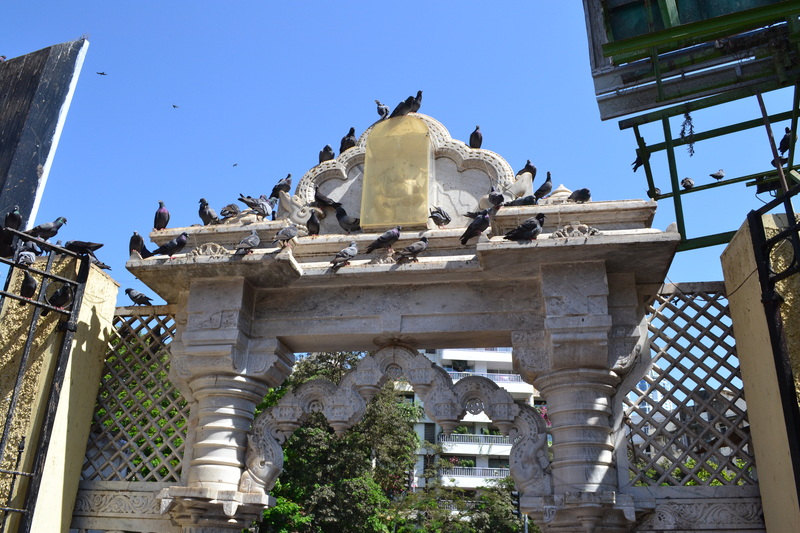 There is an aviary just inside the temple entrance, with a mass of pigeons being fed by worshippers. As I was coming out of the temple and down the white steps, all the pigeons were scattering into the air in a huge shoal of flapping wings. It was like a tornado of birds, flying together in a gust of dark air and whirring wings. 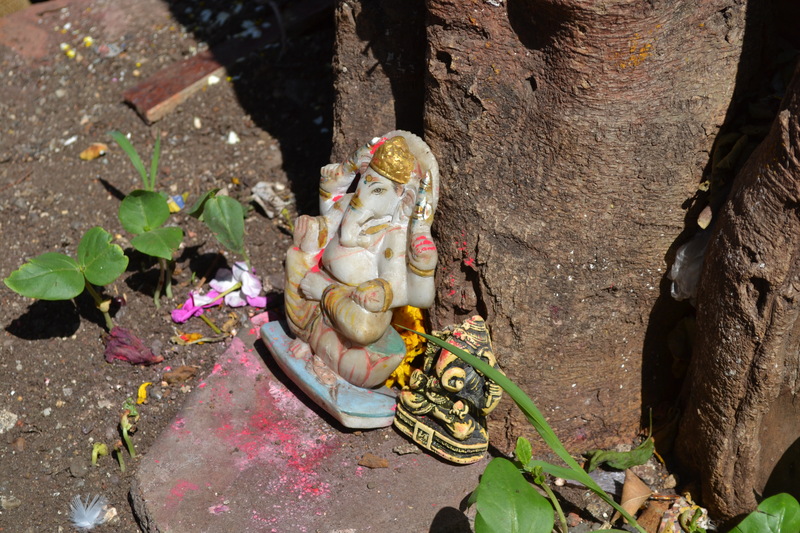 Immediately outside the temple entrance, is this little shrine to Lord Ganesh beside a tree. There are very many of these impromptu shrines everywhere in the city. 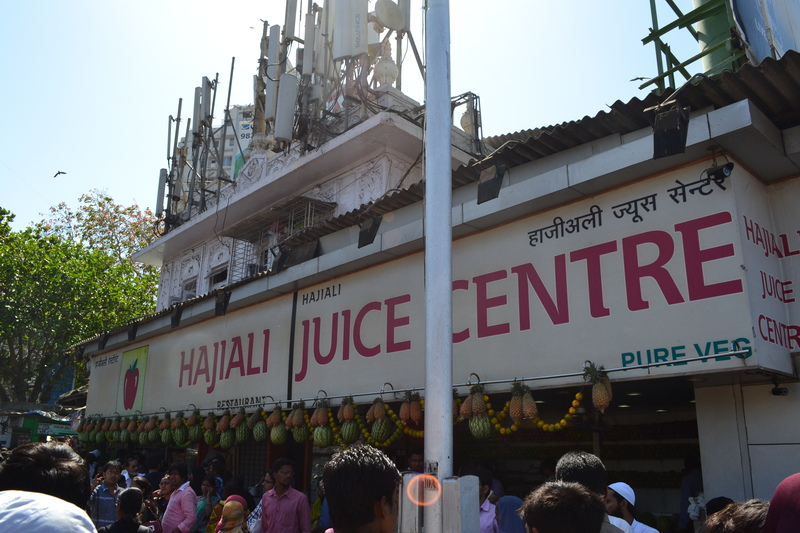 I went to stand by a shady patch of wall near the Haji Ali Juice Centre, thinking that this was likely to be the best view I could get of the island tomb. However I waited a little longer, and sensed a shift in the people around me. It turned out the causeway was just about to open, and the first couple of people could be seen battling the waves to cross to the island. My complete disregard for timing had worked out perfectly! I didn’t know exactly how to get down to the causeway but simply followed everyone else, who seemed to be disappearing down a blue-covered alleyway beside a mosque, whose interior looked extremely dark when approaching it from out of the bright sunlight. The water still sluiced over the causeway, and everyone’s lower legs were soaked. It was quite funny really. Although the water did not look very appealing, it was at least pleasantly and refreshingly cool when it forcibly bathed one’s hot feet. Who knew what this was? Some great metal thing was washed up on the side of the causeway, at the far end near the tomb complex. Inside the tomb complex, everyone takes off their shoes. The white stone underfoot is burning hot. I get swept up and carried along in a general flow of people. My sandals are taken by a man piling up sandals and I am given a numbered ticket in return. Then another man slaps an Islamic cap on my head and I get carried through a doorway by the pulsing throb of people in front and behind me. Once through a second doorway, I slot into a niche at the back in a corner so I can watch what is happening without getting in anyone’s way. 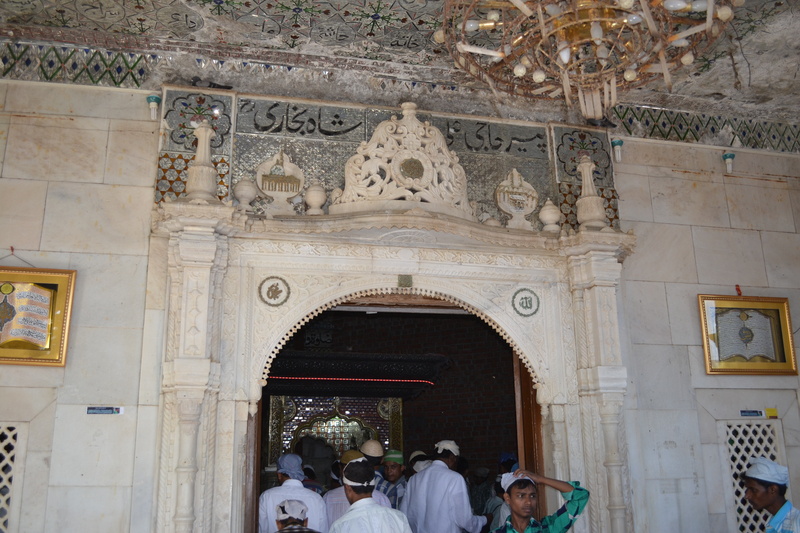 I slowly begin to realise that I am in the tomb chamber itself, and that before me lies the shrine and buried remains of Haji Ali. The interior of the tomb room is so beautiful. I watch to see if anyone else is taking photos; no-one is, so I don’t either. There is glittering dark mosaic all over the ceiling and walls, interspersed with sparkling pale stones that look like opaque diamond. 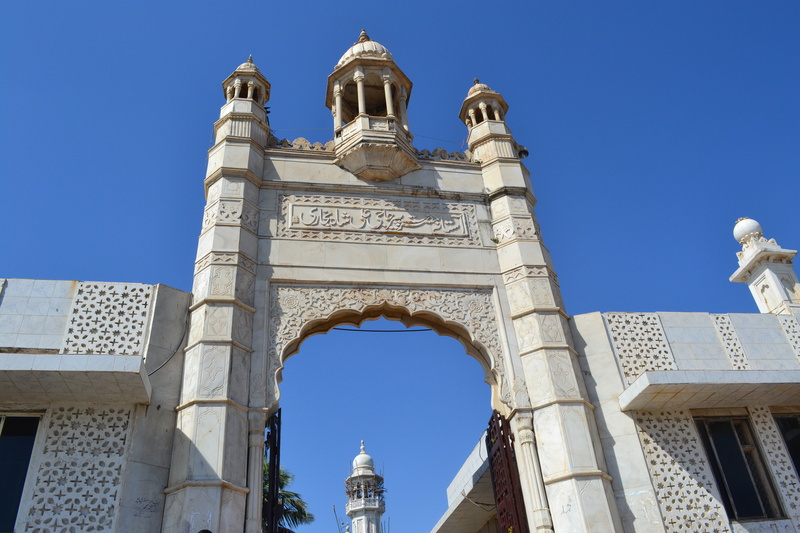 There is a chandelier-style decoration hanging directly above the tomb itself, made entirely of the same clouded diamond. 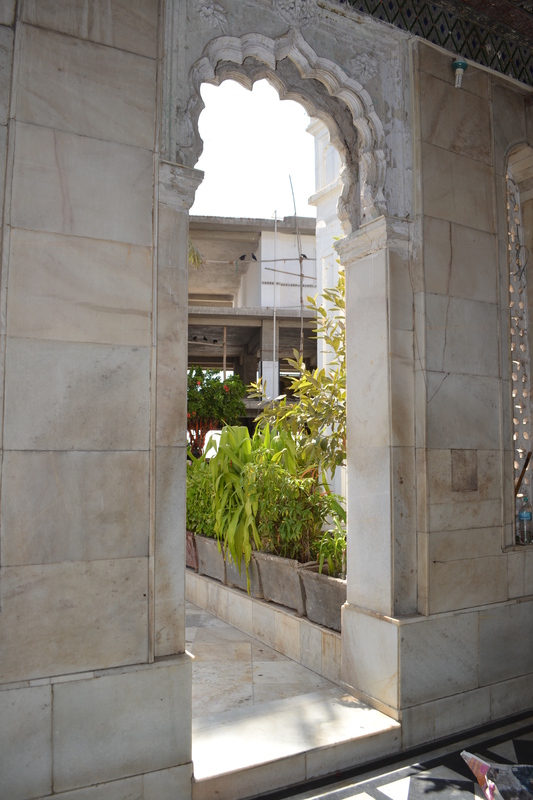 The tomb is behind low railings, and draped with many, many coloured cloths. More cloths are being constantly added, as the men tending the tomb occasionally place another one over the many already there. Men pour in through the doorway I came in, and line up to touch the cloth at the foot of the tomb. In my corner are a few young men standing watching, like me, silently, and one old man muttering prayers quietly, hands open before him and gazing intently at the tomb, with a passion that is plain to see. Near to me is an opening in the wall, and here I notice are the women viewing the tomb. They are separated from it and the men by more railings, and do not seem able to touch the cloths, or be within the glittering beautiful chamber. However the chamber is so dense that they are not much further from the tomb than I am, perhaps only a metre from the railings protecting the tomb. The main obstruction is the cram of people, but this is the same in much of the city, and following the same etiquette gets you by fine. I found it remarkable really that I had ended up right beside the central tomb quite inadvertently. Even making it across to the island I had not known how to get down to the causeway, but had only followed the clues I’d picked up from watching others. 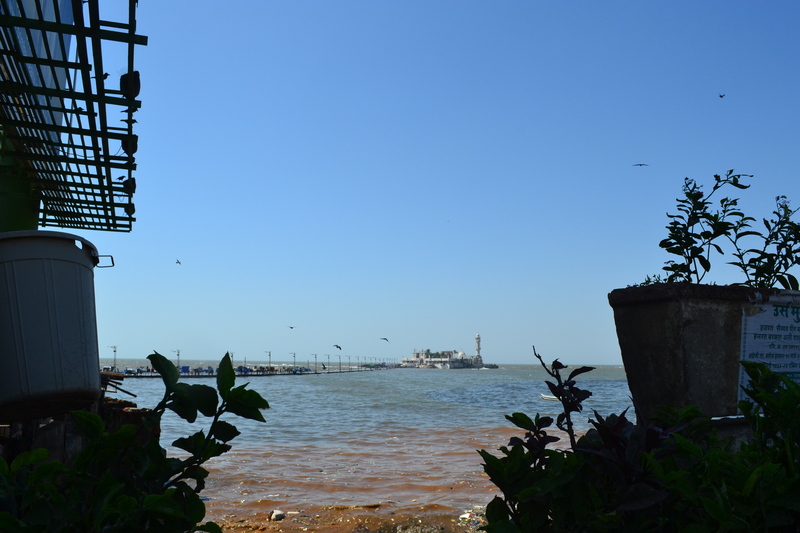 There is a view across Worli Bay from the back of the island. In the distance, on the far left of the land, you can just make out the Sealink suspension bridge that connects the suburbs of Worli and Bandra. A kilometre of causeway, looking back from the tomb complex. As I walk back, the water is still washing over the causeway, and the pilgrims and visitors are still making their way along the wave-swept road towards the saint’s tomb. I can’t get over how many people are milling about in that last picture and yet how calm in structured it all seems from how you described it. 🙂 It’s cool to see the pictures to help visualise everything too! Yes, when I looked back at that picture I was surprised by the number of people too!